I admit, with no shame or reservation, that I have a sweet tooth. Don’t get me wrong, my teeth enjoy gnashing on savory, spicy, sour, earthy, tangy, you name it. Any follower of Everybody’s Hungry can attest that I like to eat in general. But there is a special place in my arsenal of hunger crushers reserved for candy. Candy, as a general category, covers a broad array of treats these days. My revered sub-category is usually chocolate though. I like all manner of chocolate (there’s a caveat further down) and have become more adventurous in the past couple years, as well as more refined. Please don’t misunderstand. I’m no choco-snob (except for “white chocolate”. I mean, it’s not even real chocolate!). My in-a-pinch, go-to, all time favorite candy bar will always be a Milky Way. But nowadays there is a whole culture around pairing chocolate with exotic ingredients and beverages. I’ve even tried my own hand at variations on chocolate bark with combinations like dried blueberry, pistachio, sea salt and cardamom or grapeseed oil, chili powder and strawberry Pop-Rocks. A simple and notable combo was dried cranberries, almonds and cayenne pepper. I especially like when candy makers mix styles, like the chocolate/Pop-Rocks idea, hard suckers filled with gum or nougat and fizzy candy. And the best way to be pleasantly surprised and exposed to unique combinations? Try candy from another country. Recently, during my walk home from work, my sweet tooth cried out. Heeding the call for satiation, I popped into Rocket Fizz of Ventura and began the surveying. 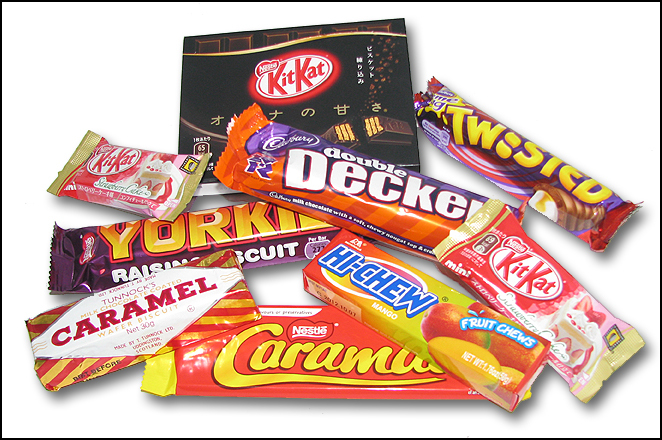 Knowing that they had recently expanded their import candies from across the pond and Asia, I veered toward those selections. I ended up with some great items, like Strawberry Cake Kit Kats and this unique, chewy mango nougat thing with gummy pieces and fizzy bits called Hi-Chew. Apparently I wasn’t quite satisfied though, because the sweet tooth bellowed again as I passed Rosie Lee Imports. Rosie Lee is a British import store full of tasty treats. And no, I didn’t eat all the other candy during the walk. Maybe that’s why the sweet tooth was still calling. I digress. I grabbed such yummies from Rosies’s shelves as the Double Decker, a twist on the Cadbury Creme Egg in a bar form called Creme Egg Twisted and variation of the Yorkie with raisins and biscuit pieces. Just seeing the word biscuit on the wrapper intrigued me. So what does this all sum up to? A fun and adventurous drive through candy land. A different country’s candy land, where you may just find a new and unique favorite because you tried something out of the ordinary. You probably aren’t going to end up in the Candy Cane Forest or traversing the Gum Drop Mountains, but that’s probably because you won’t find a good piece of candy by moving a piece of plastic around a board game anyway. 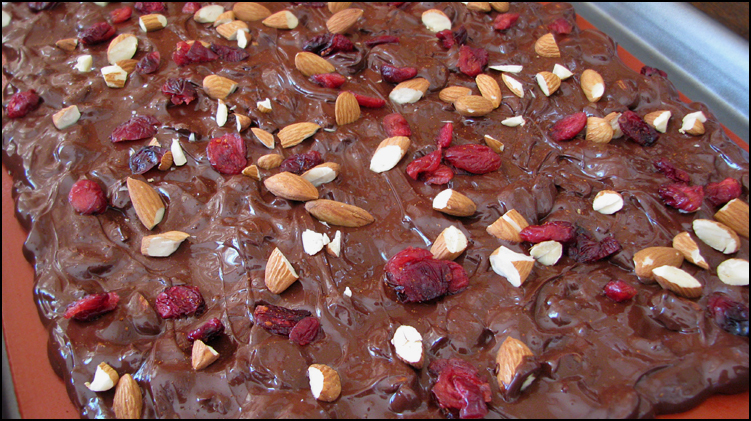 Gallery | This entry was posted in Yummy Products and tagged Candy, Chocolate, Sugar. Bookmark the permalink.